We left on a Friday afternoon, Andi, Dave and I all taking off from work a bit early for the road, which really didn't help at all as we caught crazy traffic leaving Chicago, taking 2 hours to go 15 miles. Ouch. But, luckily, we all are good friends and can actually all converse together, so we just bullshitted, played some hip-hop and made time fly as quickly as possible. We got there at about 11:30 and loaded in in seconds and got right down to playing and we really didn't stop until we left at 1 on Sunday afternoon. The surprise of the meet for me was just how much I enjoyed playing pinball. gunbird18 has a Pinbot and a Bride of Pinbot in his house and both were played constantly all weekend. There's something about such an organic game that can be fun from time to time. I ended up playing so much, my arm and hands hurt from repetitively hitting the flippers. It was even hard to type when I got home. Awesome. Fire Shark was the surprise game that gunbird18 bought for the meet, finding one locally on craigslist of all places. It was not s much of hit as I was hoping it might be, but I did enjoy the hell out of it and luckily got a chance to borrow it from Todd. 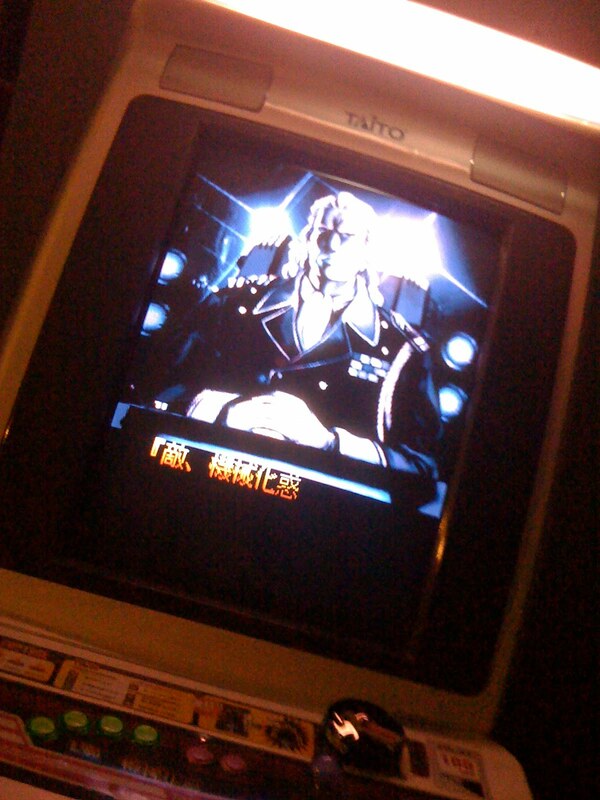 What was a hit was Game Paradise's Time Attack mode, which must have been on one of the cabs for 6+ hours. Caldwert killed it with most every character and it was impressive. The scoring contest was the 2-Minute Mode of Soldier Blade and Dave took home the title, beating out a bunch of people who, just like my previous meets, really dig the Caravan titles, making it a pretty impressive run. As always, it was good to see everyone and play together and good to meet new people. A HUGE thanks to Todd, aka gunbird18 for having Dave, Andi and I over for the weekend. Thank you for making the long trip, guys! This was such a care-free meet! I wish I could host one of these every three months, but I know schedules and travel will not allow for this. So maybe once every six months works for now. One in Missouri and one in Chicago. I enjoyed meeting everyone! It was great to see you 1CC DDP! And I hope everyone had a lot of fun! Thanks to Andi, Dave, and Geoff for being great guests! I've been avoiding any pinball for fear I'll start wanting to collect them as well. :P Looks like gunbird18 has a nice setup! I'm glad to see everyone had a blast at the meet. I'll do my best to make it to Chicago for the next go-around. I'd like to say that I really regret missing the meet, but we had perfect weather in Florida for 6 out of 7 days we were there. Even the trip down through Illinois, Kentucky, Tennessee, and Alabama was beautiful! I managed to eat about every kind of seafood I can think of, drink about every kind of beer I can think of, and I even managed to read a good book in the sun. (Ok now I'm just rubbing it in)..
@Dave K. - Yes, arcade pcbs and cabinets are a money vacuum, as you certainly understand! The care and feeding of pinball machines is 10x worse! @brentsg - Yes, you are rubbing it in now...I love Florida! Wish I could live there! It was a blast... pinball is a slight bit addictive, but I think the upkeep on one of those machines would make my desire to collect them fad quite quickly. Thanks gunbird for letting us crash at your place, punch your pinball machines, and play way too many games.